There were over 50 air raids on the town of Brighton during World War II. Many are well documented, like the “infamous” raid on the Odeon Kemp Town on Saturday 14th September 1940. Brighton was of little military importance, raids were indiscriminate, however German pilots would drop unused bombs after raids on London or more important targets as they flew back over the coast, homeward! Nearly 200 people were killed in these raids and 200 houses completely demolished. Of course there were hundreds of casualties, and damaged buildings ran into thousands. The biggest raid on Brighton was at lunchtime on 25th May 1943 when up-to 25 German planes flew in at low level. Bombs were dropped over a wide area, and the number of fatalities was 25 with over 50 serious injuries. The photo of Park Crescent Brighton shows the aftermath of one of the 50 plus raids. The date is unknown, but hopefully someone can enlighten me! At first glance I thought the photo was taken from the north end of the Level, looking north up the Lewes Road. However further investigation, and with the aid of the 1946 map of bombs dropped on Brighton, it can be seen that the Park Crescent bomb dropped on the rear, north side of the Crescent. A section of the 1946 map indicates the actual position. Looking again at the photo, it must have been taken looking southwards towards the Level. An interesting article, Peter. If you were looking at the same book as me, ‘Brighton & Hove ‘Under Fire”, the picture appears between bombings in 1941 & 1943, so I should imagine the date is around 1942. Timothy Carder, in The Encyclopaedia of Brighton, says 1942, but gives no date. I remember sitting aged 3 on the first floor front room in our house in Addison Road on a hot day in 1943 when the road got hit without warning by bombs which demolished a block of ten or so houses in Addison Rd and Colbourne Rd. Quite scary – no time to get to the Anderson shelter downstairs. Was this the same raid you speak of involving 25 planes? This bomb was dropped in 1941. I was a paper boy and delivered the morning papers from the stationers opposite the houses that were hit. This photograph was most likely taken a few days later for the debris looks as though it has mostly been cleared up. My great-grandmother was in the bedroom of her house in Colbourne Road in March 1943 when a bomb crashed through the window and landed in the back garden. This must be the incident that Pat recalls. Four houses in Colbourne Road were demolished and rebuilt in 1947. The houses in Park Crescent which were bombed were 24-27 Park Crescent – the photo must have been taken outside the Park Crescent pub. These houses were only rebuilt in the 1980s. I remember playing in what was (accurately) called ‘the bomb site’ as a child. Can anyone tell me the origin of the name Colbourne Road? A possible derivation for the name Colbourne Road has been noted elsewhere on this site. Follow the links from the home page: Areas St Ann’s Well Introduction to St Ann’s Well What’s in a name. If you look carefully at the houses opposite the Park Crescent pub you are able to identify the new houses that replaced those destroyed by bombing. I have just seen the photos of bombings in Park Crescent. My mother was a fire-watcher on the roof of the Salvation Army Hall, she never mentioned how dangerous it was. Later I guess after the rebuilding I had piano and speech lessons with a Mrs Campbell in the crescent. I was born in 1940 and we lived in Grosvenor Street, off of Edward Street. When I say ‘we’ I mean the Jeffery family. Our house was demolished by a German raider in the middle of the war. I’m not sure of my age when this occurred (perhaps 3 or 4) but it was a traumatic experience and left me with mild claustrophobia. I remember playing in our garden riding a pedal-cycle and seeing planes in the sky, then a woman (it was my mother) running out and grabbing me. My next memory is being squashed between the grown-ups facing a wall of rubble, then a face and hands coming through to get us out; we were in our air raid shelter. Finally, my last mental picture is of a crowded room and a man being carried with blood on his face; we had been taken to the Brighton Boys Club. Can anyone put this experience in its local historical context? Hi, I need a help. A friend of mine showed me a WWII photo of a crashed RAF plane in a seafront of a city and I was told it was Brighton, UK. Any of you has any idea on this matter and would like to help me identify the plane or the circumstances of the crash (seems to be a Tempest or a Typhoon). I would be more than grateful for that. I’ve seen a photo of a “fighter” type plane crashed on Hove beach, the photo was part of the WWII exhibition on display in Hove Museum, I think the photo was from some collection, perhaps owned by the city. I had never seen it previously in any of the local Brighton & Hove history books. I don’t think the exhibition is still running but you could contact the museum to find out more. Good luck! Re Park Crescent. We were born at 48 Park Crescent between 1940 and 1943 although our parents lived there from 1939 to 1947. My Father’s surgery was in the basement which also acted as a bomb shelter during the raids. 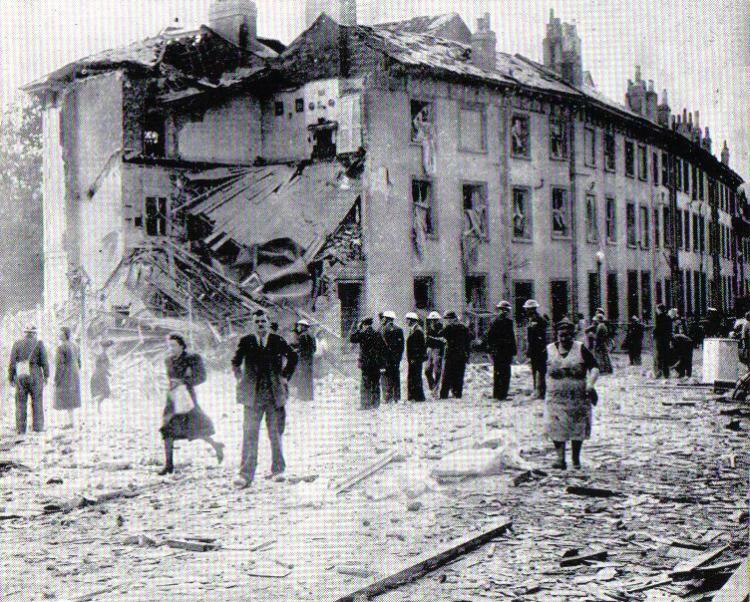 We remember well having to take shelter there and visiting the bomb damaged houses in the crescent. Alex, David and George Pincus. My great granddad and my granddad lived at 24 Park Crescent in the 1901 census. They were James Fowler (1858) and Walter Fowler. I have a picture of James Fowler surrounded by his family Walter, Nellie, Bertha and Annie, it was taken by the local paper as it was James’s 100th birthday. James worked on the railway for 53 years and was a member of the Salvation Army. Would love to know if anybody remembers them and have any tales to tell? I too played in the ‘bomb site’ even when it became a ‘building site’ in the early 1980’s when they rebuilt these houses. I lived in a flat at number 32. I loved growing up in Park Crescent, we moved out in 1983 when i was 13. I often wonder if it has changed very much and whether they still hold the bonfire night and annual fete. I would love to have a look around now to evoke many happy memories of my childhood. The bombing of Park Crescent occurred on 25th May 1943 and killed two women at numbers 24 and 25. The 500kg bomb dropped by a Focke-Wulf 190 passed through the Park Crescent Inn, traversed the road and demolished the two houses opposite. Does anyone recall a girl named Rosemary (aged about 15 during 1942/45) who was often to be seen overlooking Union Road from the rear wall of Park Cres gardens – I often stopped on my bike to have a chat with her. Fond memories. I would like to add a correction to the date of the above bombing in Park Crescent. This took place in 1941. The reason I am adamant on this is through these facts: Prior to leaving school I was a newspaper delivery boy and worked mornings at the paper shop named and owned by Mr Hazlegroves, right opposite the bombing. I remember clearly collecting my papers to do my round the following morning when the ARP were still digging to rescue people from the rubble. I was then 14 and left school at that Easter holiday and gave up the paper round to work full time at George Freeman LTD. In ‘Brighton Blitz’ by Dave Rowland 1997, it lists those killed in action May 25, 1943. It includes two residents of Park Crescent, numbers 25 & 26a. It records also that the bomb passed through the Park Crescent Inn before exploding in two house across the road. There is a detailed Family Tree published (freepages.genealogy.rootsweb.ancestry.com), researched and compiled by the grandson of Luther Morris, the Landlord of the Park Crescent Inn, and his wife Annie, at the time of the bombing. It states: “Address 1943, Park Crescent, Brighton, Sussex. Left Park Crescent on Tuesday, 25 May 1943 after being bombed and went up to Mays on that date for 7 months. Returned to Park Crescent Inn on 14 December 1943.” Source: “Birthday Book”. The Tree further states Luther Morris died in 1948 at the Brighton County Borough Mental Hospital in Haywards Heath. His wife, Annie, died in 1951 at the Brighton General Hospital. My Mother, Elsie Peters, is the lady running with the bag at the centre of the picture. Mum lived in Devonian Court behind Park Crescent after marrying my Father in 1941, and was an ARP Warden in this area. I have an original of the photo which Mum obtained from the Evening Argus and can remember Mum telling me how she had go to the ARP HQ once the sirens had sounded. My grandmother, Clara Boast, and my aunt Mabel lived at 27 and were in the house when the bomb fell. They sheltered in the basement under the stairs. They continued to live at 27 for some years afterwards. The exposed side of the house, adjacent to the bomb site was supported by wooden buttresses (as far as I recall, having been 10 years old at the time….it’s a long time ago!). There was a large EWS water tank in what had been the basement area of the destroyed house next door. Apologies for the error on the date of my earlier posting; it should of course be 1943 – senior moment! Hi Andy. The first line of your message posted on 23/04/2016 shows how easily mistakes can be made, as I think you meant to write 25th May 1943, not 1941. Park Crescent was also bombed in 1941. A bomb is marked as landing in the gardens of the Crescent. The bomb blast from this did damage to the house at number 29. My Mum and I were rescued from the garden flat at number 29 at the time. I was born in April 1941 and only a baby when it happened. Mum had to move out because of the damage and at the time of the 1943 bombing on Park Crescent she was in hospital given birth to my brother on the 24th May and living at a different address. So it seems Cyril Pelham’s recollections are correct and that Park Crescent suffered from bombings on two occasions. I do have another photo of bomb damage at Park Crescent, I assumed it was the same as above, but from a different angle, I will have to examine, perhaps it shows the other bombing!